Sudoku Rules | How to solve the Puzzles. How to solve the puzzles. The basic rules of sudoku. Although some Sudoku puzzles may keep us awake all night, the rules for solving them are very simple. This may be one of the reasons that make Sudoku so great. 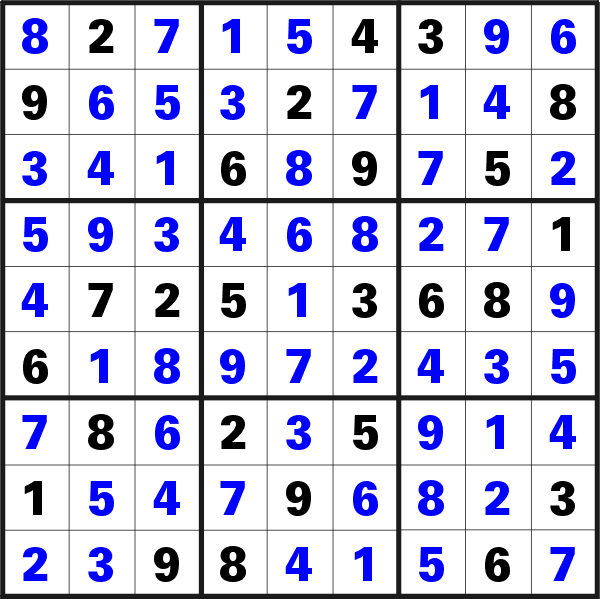 The sudoku grid is composed of 9 rows, sometimes labeled 'A' to 'I', 9 columns labeled 1 to 9 and 9 boxes usually marked by heavier borders. Each row must contain all numbers from 1 to 9. Each column must contain all numbers from 1 to 9. Each box must contain all numbers from 1 to 9. It follows that any single number may appear only once in the same row, once in the same column and once in the same box, or in other words no number may appear more than once in a row, in a column or in a box. The unsolved puzzle showed only the givens (the numbers in black). The numbers in blue represent the solution. As can be seen in the picture, every one of the 9 rows of the grid contains all numbers from 1 to 9 and, of course, no number is repeated. The same can be said for every column, and every box.